21st century is the century of digital revolution. Internet penetration in developed countries is almost 90%. In developing countries, also, the internet penetration is increasing very rapidly. Adults as well as teenagers both are using mobile phones regularly. There is an increasing preference towards smart phones over normal phones. As in smartphones, you can access internet, chat etc. But this mobile revolution has become a boon as well as curse to the parents and youngsters. Teenagers are using phones to send inappropriate messages through SMS, WhatsApp or other social networking apps. This is an embarrassing situation for the parents. They need to handle this situation very carefully. ‘Prevention is better than cure’ and many parents believe in it. You can prevent any real trouble which can occur in the life of your children if they are sending inappropriate message. Thus, many parents are using spying software to keep a tab on the activities of their children. One such spying software is SpyApps. It has got amazing features which gives complete picture of what all activities are carried through the targeted phone. Without even accessing the targeted phone, you can get to know the messages which are sent or received through the device. What you need to do is just to install the software in the phone. Regarding text messages, this software enables you to view any text message which is sent or received on the targeted device. Details which are covered in the text message include – content, whether the message was received or sent, date and time when it was received or sent and phone number of the sender/recipient of the text message. This messages can be viewed on the control panel of SpyApps . This control panel is very simple to operate. It has different tabs through which you can access the information. All data is kept stored in your control panel which can be accessed anytime. The entire conversation history gets stored in the control panel of SpyApps which can be accessed remotely from your personal computer. Not only SMS, you can also track the conversations which are taking place through social networking sites and apps. Children use social networking platforms like Facebook, WatsApp, Viber, Skype etc. extensively. Sometimes they are not aware about the do’s and don’ts of socializing on a public platform. So, for safety reasons, the SpyApps and other such genuine software prove to be handy. You don’t have to worry about price. SpyApps software can be installed in iPhones and Android devices easily. Cost for it is only $0.33/day. You can take a free trial of this software which is available for 48 hours. Once you are comfortable with the usage of this software, the next steps can be taken. Thus, raising children will be an easy job for you because of this software. You can blindly trust on this software to take care of all the activities done by the children behind your back. Your child’s future will be secured by doing some simple tasks like using this software. After all, you are using this software for a good purpose. if you ever require the services of a hacker, i implore you to try your very best to hire only professionals. computerguru146 will help you get your job completed. i was able to hire the services of an elite, asides the fact that he provided a good service, he also gave a very efficient customer experience. he carried me along with every process and didnt leave me in the dark. his contact is as below, am sure he will help you too. Hello you all , first of all this is not a spam because I am posting here just to show my appreciation to mike. He helped me discover that my wife of 8 years has been cheating on my me my best friend. He helped me hack her phone and gave me access to his text messages including deleted text that goes as far as 6 months. You can contact him on michaelstealth9 at gmail dot com . He does all other sort of ethical hacks too including access to any social network profile , whatsapp , Facebook and other social profiles. This is the only way I can thank him for helping me. I was able to get evidence on my cheating husband through the service of stokehackentatgmaildotcom… I got detailed info about his secret dating, call logs, Skype, Email, Facebook, WhatsApp and others and he hacked it without physical access to his phone and laptop. You can contact him too he also helped two others I know. There are certain things you should know before contacting any hacker . Hackers reputation, work rate , price and mode of payment.. I thought I will be unable to prove to the judge that my ex husband is a cheat! With much recommendation here on discus, I contacted the hacker cyberaddict111@gmail.com he helped me with all the prove I needed . I thought I will be unable to prove to the judge that my ex husband is a cheat! With much recommendation here on discus, I contacted the hacker cyberaddict111@gmail.com he helped me with all the prove I needed . He keeps his prices low and gets your work done .contact him. thank me later ..! Hello i caught him atlast if you need to spy on partner to know who he or she is chatting with or find out his or her conversations with others contact. The hacker cyberaddict111@gmail.com he helped me secretly hack my husband phone without his knowledge and I was able to spy on his whatsapp and facebook conversations with the lady he was having an affair with …you can also contact him for help. He is good. contact computerworld3017@gmail.com to help you monitor with any type of hack. He was the same hacked that help me when i needed evidence of my cheating husband, he helped me monitor all his communications and location. With his service, i assure you will catch that your cunning, lying partner. We are so good ,we work perfectly for our clients.. Just connect with us we will surely work for you bring any hacking stuff to us we are so different ..
Tools is available for use. Should you ever decide to hire the services of a hacker, I do advise that you hire an elite who will see her job through to the end.. Contact ( KristenKrook at gmail com) You will find an elite who will provide you your lasting and permanent solutions and ensure that you get what you seek. we are going to work for you perfectly, you can started monitoring your child phone. you can connect with there to knowing there location…… We are here to work for through that. Best of all hackdon005!! 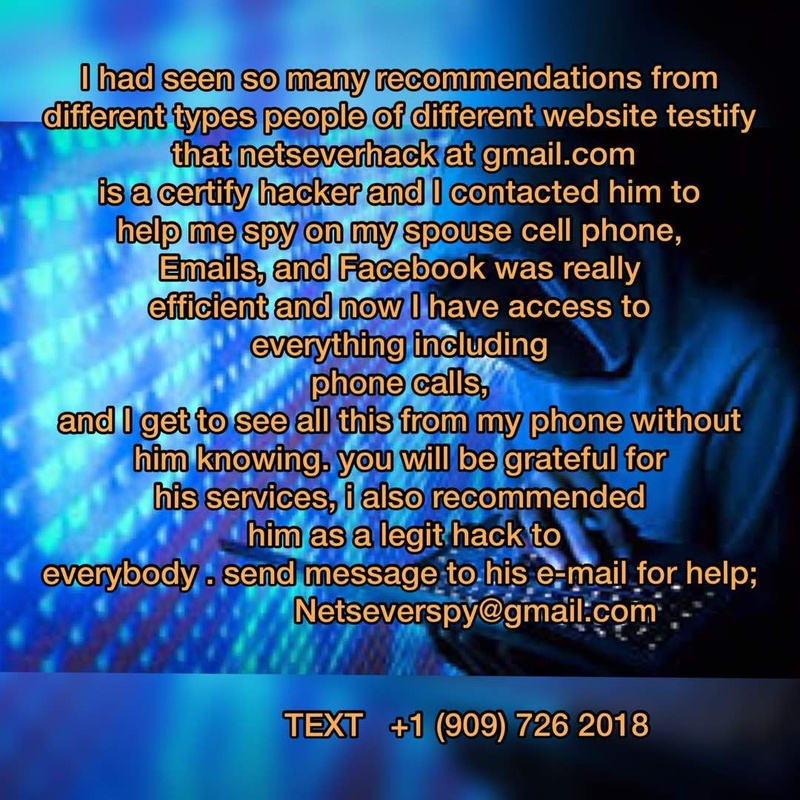 I found out my boyfriend have been cheating on me with my best friend with the help of Netseverhack. I knew he was seeing someone else even told my best friend about it but am glad i decided to not share the plan of hacking his phone with her. You can contact Netseverhack via gmail when you need help. My cousin told me about Charliehacktivist at g e mail and truly they are real and legit hackers.. I have downloaded so many applications trying to spy my wife’s phone. But none worked. Pretty much the only hackers out there I can vouch for. contact cyberspyghost @ gmail . com to help you monitor with any type of hack. He was the same hacked that help me when i needed evidence of my cheating husband, he helped me monitor all his communications and location. With his service, i assure you will catch that your cunning, lying partner.